Maite's Art History: Monumentality and New Techniques in Sculpture. Until mid 20th century a majority of the three dimensional works were mere objects. The sole monuments were those commanded by the fascism, with a promotional aim. After that, the creation of big sculptures began with the organization of competitions to create works for deter purposes. A majority of the creations that were done were abstract. It looked that the projects of the Constructivism were going to be the models of the new production, at least because they represent a kind of monumental works. At the same time the development of techniques or the invention of new technologies made it possible to give duration and monumentality to what had been ephemeral or temporary in the construction of the pioneers. A significant author at these levels is Calder. After receiving a first public commission in 1952 he acquired a fame that enabled him to inscribe in space even larger and loftier designs that could be produced only by industrial methods. The British Henry Moore was one of the first contemporary sculptors to encounter the possibility of projecting his imagination into public space. He had encountered archaic art that freed him from subjection to the model from nature; then the influence of Arp and Picasso steered him towards a more abstract expression that sought less to reproduce than to create organic forms justified solely by their presence and expression by their vitality the growth he discovered in the natural elements he began to collect: bones, pebbles, tree-stumps, seashells. There products of nature inspired his direct carving. Other of his ways of proceeding revealed asymmetry to him as a dynamic principle. He was led to experiment with the mass with a hole pierced through it, from which he would renew the relation between sculpture and surrounding space. He was not unaware of the possibilities of abstraction, but most of his works preserved a biomorphic character. He achieved this osmosis between human representation and the understanding of organic forms essentially in the reclining or recumbent figure, which he preferred as a subject above all others and which gave him the pretext for his most daring construction. When Moore took the step to monumentality, he developed a landscape sculpture in an especially close relationship with nature, in that he executed each of his pieces on a particular site. Large-sized works led him to prefer bronze, this is, modelling. Moore’s works offered a sensual experience: direct, tactile, but also spiritual in referring to another consciousness of life and its development. With him, representation of movement disappears in the expression of forms preserving the imprint of the demands of growth and the scars of time. Other of the new possibilities of construction in space of the 20th century included assemblage and iron. 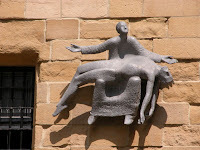 The two converged in the works of artists such as Picasso and Julio Gonzalez. 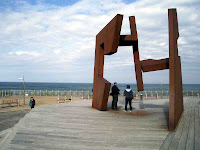 One of the best representatives of iron sculpture is Eduardo Chillida. This architect of formation did several sojourns to Paris where he entered in contact wit modern art. He turned away from figurative representations and began working with iron at the mid of the century. For him iron offered the approach to and confrontation of space by a way of a dynamic force in which the ductility of the material and the strong purpose that shapes it are combined. Working in wrought, then welded iron turned him away from the concept of mass by offering him new relations between construction and space: his assemblages embarked on the conquest of the air. His first works were inspired by the form or the craftsman’s and peasant’s articles of ordinary use, but he transported them poetically into empty space, attaching them by a single fixed point to the ground or the pedestal, from which they radiated in manifold directions. Combining space, clawing the wind, he defied the laws of static. He recognised the demands and possibilities of metal, which was a rendered supple and malleable by its passage through fire, but which also retained the marks of the blows that shaped it, or of the force that twisted it. This physical presence of work of which the finished piece kept the imprint and which made it possible to measure in imagination the time and effect of the process of elaboration would assume great importance in contemporary creation. Working with tubes or bars, Chillida found that they divided up space. The core of matter was replaced by emptiness; the mass by air; but air was all the more meaningful in that Chillida developed his forms by following their growth. Creation is a combat with and against matter, a confrontation with the elements: fire and water. Chillida’s forms abandon verticality to develop like knotted and forceful calligraphy. Refusing to let himself be guided by the technical know-how he had rapidly acquired in 1956 turned to a thicker material which he twisted or unwound, but which kept in its fold the violence that bent it to the sculptors will. After that Chillida attempted other materials such as wood, which allowed him to work on a larger scale. He was to carry over this experience with metal into alabaster and granite, compact materials which react to light, that light which steel and later Cor-Ten steel (rusted steel) would led him to prefer in more serene architectural compositions where the impact of gesture vanished in the continuity of spirals, drawing the spectator inward to the hollowed-out centre of the heart. These knots of metal opened onto the mystery of the infinite and the void. Chillida became a builder of the invisible. Having unsuccessfully tried to get into architecture school in Madrid, he began training in the visual arts. He travelled to South America, where he was during the Civil War. He came back in 1948 and tried to develop a kind of organisation of artists but with little success. In 1950 he was commissioned to make the sculptures that would form the religious iconography of the Aranzazu’s sanctuary. The project consisted of a Piety and the frieze of the Apostles, 14 hollowed-out figures, with a great expressive force and rhythmic arrangement, in a complex which combined architecture and the visual arts. In 1950 he began an experimental phase in his sculpture in which the presence of matter and mass as formal elements was reduced and the artist sought out active empty spaces charged with energy. This desire for experimentation applied to his sculptural work. He aimed at liberating empty spaces by merging double and triple low-density units, at the same time developing the progressive emptying of his figurative sculptures. He developed his idea of emptying sculpture to the point of defining emptiness as the space of spiritual relief, the protection of the incomplete man, convinced that all empty space aesthetically de-occupied is spiritually receptive. He presented the de-occupation of the sphere and cube. This experimental search was to culminate in his “empty boxes” and “metaphysical boxes”. In this process he managed to activate empty and receptive spaces, provided with an eternal and metaphysical essence. With the completion of the Experimental Process, Oteiza considered that his sculptural experimentation had concluded.